Obama Flees The American Public | Stop Obama Now!! 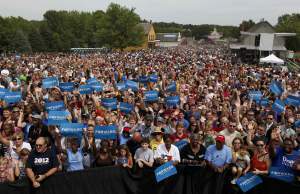 Obama zombies at a campaign rally Remember the days when Obama could still fill stadiums to overflowing with starry-eyed, robotic messiah worshipers? He seemed invincible then. Now, Obama is literally afraid to face the public. Lately, he has been meeting behind closed doors with small, select groups of wealthy donors or illegal aliens and their radical, activist supporters. Last week he gave a speech at a military base in New Jersey, where the soldiers feel obligated to be in attendance and applaud politely. It has become nearly impossible for Obama to find adoring masses willing to feed his pathological, psychopathic ego. The trend that is well in place by now of utter rejection of Obama and his collaborators in Congress is likely to continue and even accelerate in the near future.